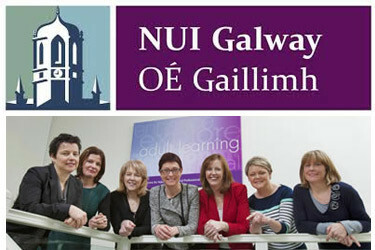 The Centre for Adult Learning & Professional Development at NUI Galway offers a wide range of part-time courses for adult learners, covering many different subject areas. Many of our courses offer you an opportunity for professional development while enrolment on other courses is motivated more by personal interest and a desire for self-development. Whatever your motivation, participation in an adult learning course builds your confidence as a learner and updates your knowledge and skills within your chosen area. Our courses cover subject areas such as Science & Technology, Business & Management, Information Technology, Arts & Social Sciences, Early Childhood Studies, Community Education and Training & Education. Many of these courses lead to a recognised NUI award – Certificate, Diploma, Degree or Masters. Certificate courses usually last 1 year part-time, a Diploma usually lasts 2 years while a Degree course can take 4 years. We also run a series of short courses every October across a wide range of disciplines, which are non-accredited. These short courses consist of 8-10 weeks of lectures in areas such as Philosophy, Creative Writing, Film Studies, History, English Literature and many others. Check out the directory for a full list of courses to see whether we have a courses that interests you.